Lightweight and compact, this lamp folds neatly together making it conveniently portable and great for taking to craft clubs and classes. 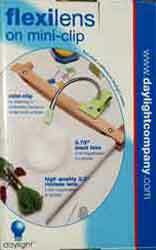 Perfect for sewing, scrapbooking, quilting and all other detailed hobbies. Light source: 13 watt daylight tube. This product plugs into 110volts. 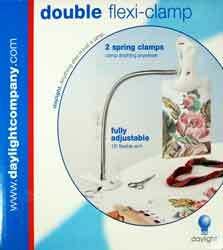 For use with Daylight Compact Lamp. This padded, protective bag is supplied with an adjustable strap. White. 2 spring clamps; clamps anything anywhere. Fully adjustable 18" flexible arm. High quality 3.5" diameter main lens 2.25X (5-diopter). 0.75" diameter inset lens 4.0X (12-diopter) for spot checking. Rimles lens gives a comfortable uninterrupted view. Weighted base has five hles enabling it to be pinned to a lace cushion or simply left freestanding on any flat surface. Ideal for lace work and detailed needlework. 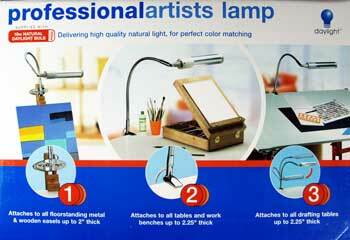 Delivers high quality natrual light for perfect color matching. 18W (100W equivalent) low heat daylight bulb included. 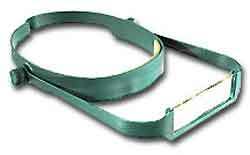 Supplied with two clamps for attaching to a variety of differenct surfaces. Flexible arm and multi-position joint allow easy positioning. Long flexible arm with a large rimless lens gives a comfortable uninterrupted view between magnified and non-magnified work. 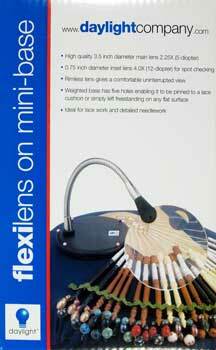 Weighted base makes this model ideal for detailed work on a desk or flat surface. Black/White. 18in flexiarm, quality acrylic 5in diameter lens, 3 diopter (1.75x magnification). An short flexible arm with a large rimless lens providing an uninterrupted view from magnified to non-magnified work. Main lens is quality acrylic, 3.5-inch diameter, 2.25x magnification (5-diopter). Inset lens is 3/4 inch diameter, 4.0x magnification (12-diopter). Can be clamped onto small embroidery frames. Easily movable. An 18 inch long flexible arm with a large rimless lens providing an uninterrupted view from magnified to non-magnified work. Main lens is quality acrylic, 3.5-inch diameter, 2.25x magnification (5-diopter). Inset lens is 3/4 inch diameter, 4.0x magnification (12-diopter). Can be clamped onto small embroidery frames. Easily movable. An 18" long flexible arm with a large rimless lens providing an uninterrupted view from magnified to non-magnified work. Lens is quality acrylic, 5-inch diameter, 1.75x magnification (3-diopter). Can be clamped onto embroidery frames, table tops, and other solid objects. Easily movable. High quality 4 spoke floorstand. 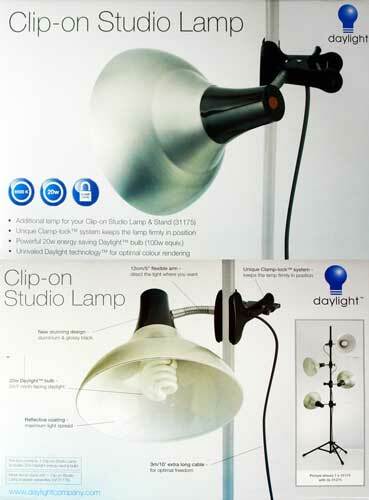 Increases mobility of Daylight lamps and is easy to assemble and safe to use. Four easy-roll casters allow for quick positioning. 25lbs weighted metal floorstand. Modern, all-purpose magnifying lamp. 5in rimless lens, 1.75x magnification (3 diopter). Powerful 13w Daylight energy saving bulb. Allows you to see intricate details in absolute comfort. Additional lenses to fit MagEyes Magnifiers. MagEyes Magnifier is a hands-free lightweight magnifier that mounts on the head with a slip-on cushioned headband (one size fits all). It comes with 2 interchangeable different strength, optical-quality lenses. Works well with or without prescription glasses. Additional strength lenses are available separately. Simple, classic, timeless design. 360-degree swivel head. Bright, efficient LEDs produce 250 lumens. Estimated 50,000 hours of continuous life. Pleasant 4000 Kelvin white light. Robust construction--built to last. Flicker-free. Solid-steel body. Light area: 36" diameter. Base diameter: 6.5"/Max height: 24"/Cord length: 3'. L.E.D. Craft Light and 2x Magnifier with two brightness levels, flexible arm, strong wide mouth clip, large magnet on bottom for securing to metal surfaces, 3 AAA batteries. L.E.D. 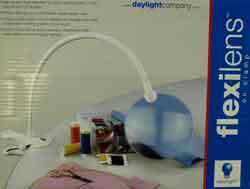 Craft Light with two brightness levels, flexible arm, strong wide mouth clip, 3 AAA batteries. Slim design for improved viewing area. 22w Naturalight tube (energy saving). High quality 13cm (5") lens for detailed work (1.75X). 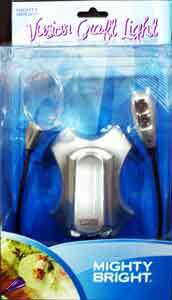 Supplied with tube, table clamp, and lens cover. High quality 5 spoke floorstand. Unique design for optimal stability and smooth movement over all kinds of surfaces. Weight 10kg. Ideal for all your needlework, crafts and reading. Unique extendable arm for extra reach, perfect for sewing and quilting. 20w low heat Daylight bulb (100w equivalent) lets you work in comfort for hours longer. 3 unique accessories included - craft tray to keep everything conveniently to hand, chart holder to keep your designs in clear view and magnifier which makes fine details easily visible.